My Swedish book Morgonrodnad. Socialismens stil och mytologi 1871-1914, which translates into something like Reddish Dawn. 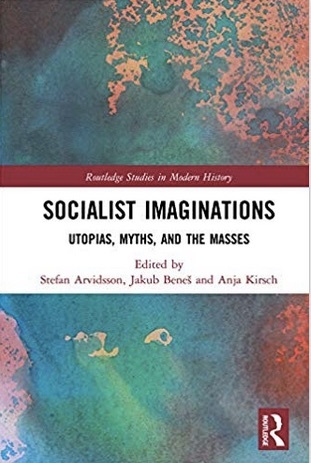 The cultural style and mythology of socialism 1871-1914 appeared in 2016 and will in due time be published by Routledge. I was very pleased that the publishers for front cover chose a sketch by Walter Crane (1845–1915), identified as “the artist of socialism” by H.M. Hyndman because of his tremendous influence on the art and propaganda around the fin de siècle. * As pleased as I was, I however lamented the fact that thereby another sketch by Crane, also envisioning Prometheus revolting against the tyranny, would not be unveiled. I urge you to have a look on that beautiful image, in the collection at Whitworth Art Gallery. The most apparent difference between the two sketches is – besides the colour scheme obviously – the crown on the eagle’s head and – maybe – the Phrygian cap on Prometheus’. * Morna O’Neill, Walter Crane 2010:15.